ABOUT THIS PRESS CONFERENCE & INTERVIEW: Following the completion of the Beatles' 1965 tour of North America, the weary group took the month of September off to relax and enjoy home life. This gave John and Paul opportunity to finish songwriting for the group's upcoming album, Rubber Soul. It also allowed time for Ringo Starr and his wife Maureen to welcome their first son, Zak. 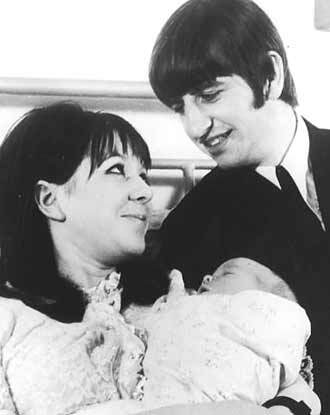 Zak Starkey was born at Queen Charlotte Hospital in London, seven months after Ringo and Maureen's February wedding. The proud new Dad held a press conference and granted interviews on September 14th with the ever-present press at the hospital. Following this, the Beatles would return to EMI studios in October to begin the recording sessions for the Rubber Soul album. On October 26th the Beatles would receive M.B.E. medals in a Royal ceremony with the Queen at Buckingham Palace. Q: "Who does he look like, Ringo? You or your wife?" RINGO: "A bit of each, actually." Q: "He doesn't have a Ringo nose, has he?" RINGO: "Oh yes, God help him. Well, you know, they say they change." Q: "Has he made any musical noises yet?" RINGO: "He's shouted out a bit, you know. Sort of, 'Get them press men out here,' and all that you know." Q: "A nurse told us earlier this morning, he has no hair." RINGO: "Well, he had it last night." Q: "Have you decided what to call him yet, Ringo?" RINGO: "'Cuz we liked the name, you know. Why is any name..."
Q: "Is it a cowboy name?" RINGO: "Not really. It's more sort of western." RINGO: "I don't know. I've sort of had this name in me mind for years, you know. Zak. It's not short for Zacharias or anything like that, you know." Q: "It's not short from Zachary?" Q: "Why did you choose it for yourself?" RINGO: "'Cuz I liked... Well, we both liked the name, and it's sort of a strong name. And it's good, you know. And we found out today it means umm... Oh, what's it mean! It means something in Czechoslovakian. Umm... Scholar! Scholar in Czechoslovakian." Q: "Well, tell me. What does Zak look like?" RINGO: "He's great, you know." Q: "And no hair yet, I presume." RINGO: "Yeah, he's got quite a lot, actually. I was so excited yesterday I just sorta kept looking at him all over. And I was looking at him today, and he's got quite a bit." Q: "Any indications that he's going to have your nose?" RINGO: "Umm, yeah. He's got quite a large bridge, you know, like I've got. But, I mean, I'm OK with it." Q: "What's he going to be? What do you want him to be?" RINGO: "I don't want him to be a drummer." Q: "You don't want him to join a group at all?" 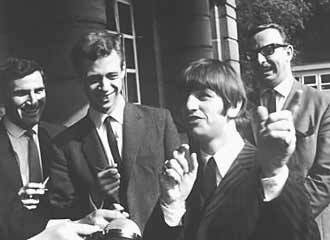 RINGO: "Oh, I don't mind him joining a group., just don't play drums, you know -- all that carrying around and everything before you make it. It's a drag."